MANILA, Philippines - The October 2014 Philippine Bar Exam results are officially released after the special en banc session on March 26 2015. Out of 5,984 law graduates who completed the tests on the four Sundays of October 2013 (October 5, 12, 19, and 26), list of passers and topnotchers who got at least 73 percent average grade are announced by the Supreme Court. 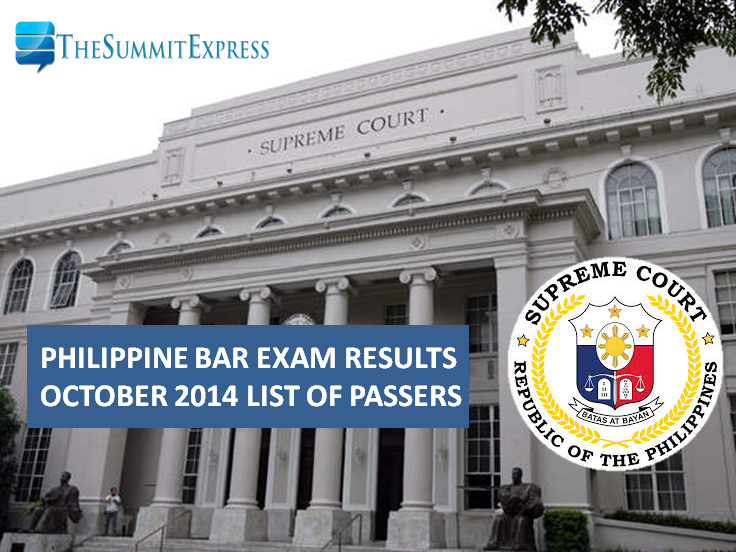 SC said that 1,126 out of 5,984 (18.82 %) examinees passed 2014 Bar exams. Passing percentage lowered from 75% to 73%. Bar exams committee was led by Supreme Court Associate Justice Diosdado Peralta who conducted examination at University of Santo Tomas, Espana, Manila through the Office of the Bar Confidant. Through the series of bar bulletins released by the Supreme Court, takers were guided from petition of bar candidates to the actual test. SC said that a total of 6,344 are confirmed bar candidates for the 113th bar exams. One of the oldest examinees was a 88-year-old Bulacan native Bienvenido Hilario, who tried his luck for the third time. On the second Sunday of tests, 350 have already opted to back out. The Supreme Court’s Public Information Office said the examinees were not required to explain their absence so there was no way of knowing if the examinees fell ill or were simply overwhelmed by fear of the grueling exams. While a bar examinee is “deemed to have passed his examinations successfully if he has obtained a general average of 75%”, the Supreme Court en banc has always retained for itself (based on its authority to amend the Rules) the discretion to make adjustments, as it did in the 2012 Bar Examinations when it lowered the passing grade to 70%. Last year, the Court lowered the passing grade to 73% in view of the structure of the results, the difficulty the candidates encountered with the MCQ portion of the exam, and in light of past precedents. The list of successful bar examinees is flashed on a widescreen at the Supreme Court front yard and simultaneously be viewed at the official website of the SC. March 3, 2015 Update: Reports said that results are out online between the 3rd to 4th week this month. Some sources specifically hinted March 19 or 24 release dates. March 9, 2015 Update: The official account on Twitter of the Supreme Court Public Information Office says: "For all those asking about #BAR2014 results, the release date will be announced by the PIO ahead of time. This is not that announcement." March 14, 2015 Update: According to our source, the deadline given to the examiners to finish checking is March 24, 2015, but it's possible that the checking is already complete or is almost complete. With this, it's possible that the results can be out as early as March 17 or 19 or on March 24 or 27 at the latest. March 19, 2015 Update: SC to release October 2014 bar exam results expected after the special en banc session on Thursday, March 26, 2015. Full details. March 26, 2015 Update: Bar exam results #BAR2014 officially out today expected at 11:30am. More updates coming up on this page. Stay tuned. "QUICKSTATS #BAR2014: 6,370 applications received; 6,344 admitted to take the exams;5,996 showed up on 1st Sunday; 5,984 completed all exams." - Supreme Court. SC: Please stand by for the forthcoming release of the 2014 Bar Examination results. Reports: SC Special en banc session finished. Printing and validation of results are next. Results will be posted here in few minutes. Once announced, the Bar passers may secure their clearances from the Office of the Bar Confidant during office hours, 8:00a.m. to 4:30p.m. on the specified date. Update: Schedule is set on April 6 to April 23, 2015. The oathtaking schedule for the passers of October 2014 bar exam is set on April 24, 2015 at 3pm at the Philippine International Convention Center (PICC) in Pasay City. The Philippine Bar Examination is the professional licensure examination for lawyers in the Philippines. It is the only professional exam not handled by PRC and exclusively supervised by Supreme Court. Some Filipino lawyers say the Philippine Bar exam is especially tough because it is centralized and covers eight bar subjects which only 20% to 30% of examinees successfully hurdle. The bar examinations are held only once every year at a designated venue under the supervision of the Supreme Court which designates an incumbent Justice to chair a committee consisting of eight (8) examiners, one for each bar subject. The examinable subjects are: Political Law and Public International Law, Labor and Social Legislation, Civil Law, Taxation, Mercantile Law, Criminal Law, Remedial law and Legal and Judicial Ethics. The examinations are given in the course of one month, spread over four (4) Sundays and are the only professional licensure examinations which require the examinees to answer a combination of open-ended and multiple choice questions in long hand. Due to the scope and difficulty, the bar examinations are regarded as the most prestigious professional licensure exam in the country. The Office of the Bar Confidant of the Philippine Supreme Court releases the Official List of Successful Bar Examinees, usually during the last week of March or the first week of April of every year. In the case of the 2013 bar exam, results were released on the third week of March or earlier than usual. Prior to the release of results, special en banc session for the 'decoding of bar exam results' is being done. Decoding is the process where the SC orders the Office of the Bar Confidant to open the sealed envelopes with the names of the candidates who passed the exams. Last year bar passing percentage of 22.18% (1,174 out of the 5,292) is higher than the 2012 outcome of 17.76%. In October 2011, passing rate was 31.95% ( 1,913 out of 5,987) and recorded as second on the history of highest passing rate since 2001. 2001 has 32.89% (1,266 out of 3,849) successful examinees. Mr. Nielson G. Pangan, a graduate of the University of the Philippines topped last year bar examinations with a rating of 85.80%. Like Us on Facebook or Follow Us on Twitter to receive news related to October 2014 Bar Examination. Subscribe also on our E-Mail List via Feedburner.